Welcome to Rare Rabbit. We design jewellery, accessories and homewares for women and children. Our designs are vintage inspired yet thoroughly modern. We create using the warmth of wood whilst being inspired by a modern edge. Whenever we can we use sustainable materials. A long term passion for Art, Design, Photography and all things 70’s led an ex Legal Aid lawyer with four small children to create Rare Rabbit. With an instinct for trend, popular culture and the authenticity of leather and wood, Rare Rabbit has captured a special place in the hearts of those who have been initiated. We travel to the places where our products are made to observe work practices, ask questions and spend time with employees. We have implemented a scholarship program for the children of our largest supplier. This is part of our Reading Rabbits program. We pay a proportion of the expenses for a child to attend school. Our workers receive the award wage plus a scholarship allowance. This scholarship program ensures the workers families receive the benefits. Our goal is to design quality products that inspire creativity and that we know are produced fairly and at the same time enjoy this small window of time we have with our children. 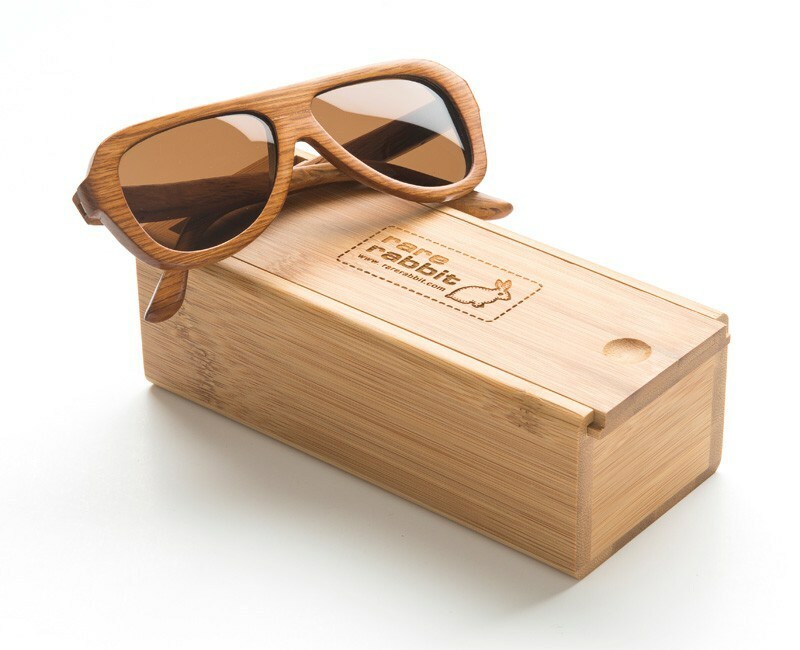 These stunning sunnies are light & natural made of Oak, 100% U.V protected with polarised lenses, sturdy wood frames & come in a beautiful laser cut wood case. Stand out from the crowd and be a trendsetter this summer (or all year round). Available now at Nest & Burrow!